Temperatures are setting just above zero degrees (Celsius! ), a grey unchanging sky blankets the city, and a freezing drizzle comes and goes and banishes us inside. What could we possibly do in Paris during wintertime? I say winter is an opportunity to do things we would not usually do in other circumstances. If you would rather stay tucked inside with a hot tea, that’s perfectly fine, but spoiler alert! There’s more you can do. 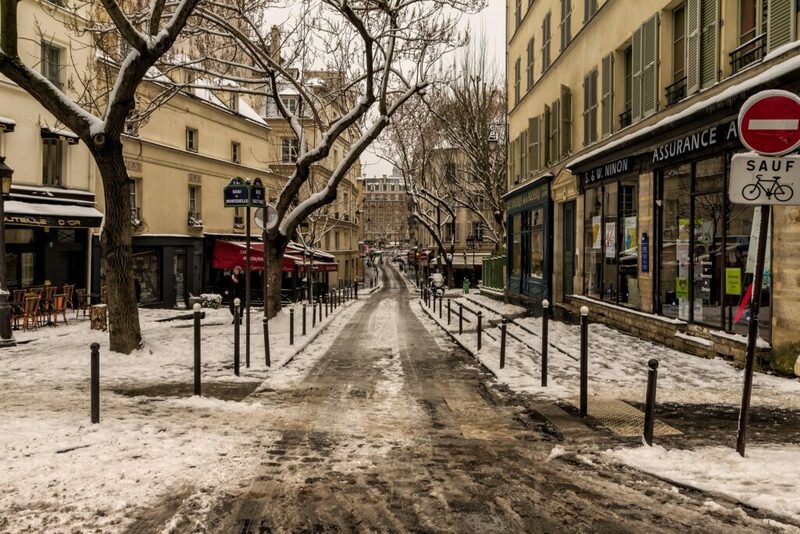 Here you have 5 good plans to do in Paris during winter. If you’d rather be indoors and you have been reading our articles on Monet, you might want to go to the Musée de L’Orangerie. Discover all about the relationship between one of the most famous French impressionist painters and Georges Clemenceau during World War I in an original exhibit. It’s up until March, so make sure not to miss it! Did I say the museum has a nice temperature of 25°C inside? When you walk out of L’Orangerie museum, you will not be far from the Grand Palais. This majestic building not only hosts numerous exhibitions all year long, but it is also one of the venues where Chinese New Year celebrations will take place in Paris. It’s the perfect occasion to learn all about this Chinese tradition, and moreover, to celebrate it! There will be music, markets, joy and warmth that will make you forget the cold outside. There is nothing more comforting than enjoying a warm beverage in a nice café. I would recommend Angelina’s hot chocolate, L’Africain, a beverage so dense you’ll need a spoon to drink it! Located in the 1er arrondissement, this famous salon de thé opened its doors in 1903 and saw Coco Chanel and Marcel Proust among their clients in their iconic, Belle Epoque-style tearoom. Make sure to taste one of their pastries as well, for winter is a time of indulgence! While ice rinks usually close at the beginning of January, I know of one that opens until March. Back in early January, the Compagnie des Bateaux Mouches installed a winter rooftop on its harbour in the 8ème arrondissement with a gigantic ice rink that overlooks the river Seine. You may also enjoy the view from their restaurant, while eating a tartiflette and enjoying their cozy winter ambiance! Finally, if you cannot wait for Spring to begin, I would suggest to visit the Jardin des Plantes. Opening on Saint Valentine’s day, One thousand and One Orchids is an exhibition of said flowers taking place in their beautiful, tropical greenhouse. You may discover unfamiliar and rare species of orchids and even buy some at their pop-up boutique with the precious advice of professionals.